Orlando, FL (March 6, 2018): David Weekley Homes, the nation’s largest privately-held builder, is now open for sales in the highly-anticipated Lake Mary community of Griffin Park. The gated master-planned community offers 138 homesites, with three series of single-family homes currently available: Townhomes, Bungalows and Gardens. Priced from the $285s and situated on 21-foot homesites, Griffin Park Townhomes feature six two-story floor plans ranging from 1,500 to 1,600 square feet in size. These townhomes have two to three bedrooms, two to three full baths, a half bath and two-car garage. In Griffin Park Bungalows, homebuyers can choose from five floor plans situated on 28-foot homesites, priced from the $370s and offering 1,600 to 1,800 square feet of living space. These two-story homes feature three to four bedrooms, two to three full baths, one half bath and a two-car garage. Homes in Griffin Park Bungalows offer options for such upgrades as a super shower in the owner’s bath, guest suite with sitting area, French doors at the study and tray ceiling in the owner’s retreat. 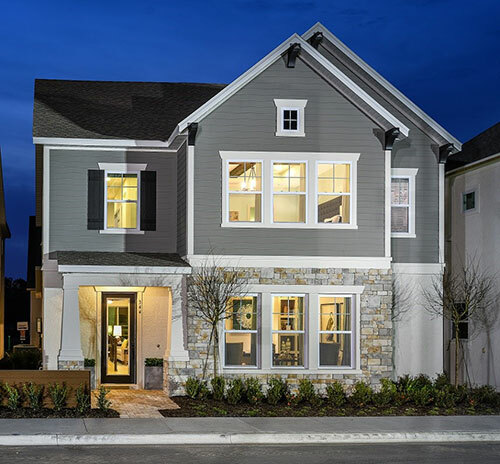 Homes in Griffin Park Gardens are set on 41-foot homesites and priced from the $450s. Ranging in size from 2,100 to 3,000 square feet, these two-story homes showcase three to five bedrooms, two to four full baths, one half bath and a rear-load, two-car garage. Homebuyers in Griffin Park Gardens can choose to add such upgrades as an extended covered porch with French doors, a super shower in the owner’s bath, a third-floor bonus room and more. The fourth series within the community, Griffin Park Cottages, will be available for sales later this year. The fully-furnished model homes, The Mohegan within the Bungalows Series and The Saddleview from the Garden Series, are open daily for tours. Griffin Park is situated within walking distance of the upscale town center, Griffin Farms at Midtown, which will include Lucky’s Market, 24 Hour Fitness, Dunkin Donuts and other retailers. Homebuyers in Griffin Park also enjoy a community pool with cabana, mews and gathering areas, and convenient proximity to downtown Lake Mary, I-4 and SR 417. For more information about David Weekley Homes in Griffin Park, contact 407-478-5933. The Saddleview in Griffin Park’s Garden Series from David Weekley Homes is open daily for tours.